Nippon Paper Industries Co., Ltd. provides liquid-packaging cartons for milk and juice with a three-pronged marketing approach involving machine sales, carton supply and maintenance service. Based on abundant expertise and outstanding technology, the company has achieved a 33% share of the liquid-packaging carton market, as the leading in packaging for food, beverages and household items in Japan. 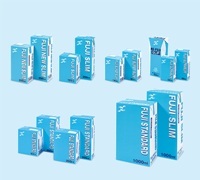 NP-PAK, NS-Fuji pak®, NSATOM®, NS-Slim Mini, filling machine.